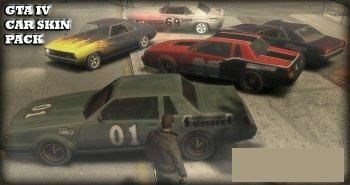 New colors and forms of coloring for various cars in GTA 4, these are different inscriptions (01, №1, etc. ), drawings (stripes on different parts of the car, fire on the entire front bumper), in general we put and admire. Using OpenIV or SparkIV, open vehicles.img, and replace there files such as sabre2.wtd and vigero2.wtd on the files from the archive. Altered ways of moving the aircraft. Now the air vessels run directly over the Liberty City, and do not go around it. Installation: Copy the paths folder to the common / data directory with the game installed, confirm the replacement of the files. The script on the beta. 1. Easier to drift; 2. The mouse is almost unnecessary when driving; 3. There is no soapy road. New textures of the house in Alderney. The house is completely changed, beautiful interior, in general we look at the screen and swing! vigero2 не работает, какая была такая и осталась почему? Это переносное значение, что-то типа "Зачет ставлю тебе за файл". Вообщем, "отлично" или "круто", означает. А вообще, крутая окраска! Здорово!